The workings of a home air-conditioning system are mystifying to many of us. Furnaces are easy to understand—they heat air and blow it around your home in ductwork. Boilers make hot water or steam and move it around your home in pipes. But how do air-conditioning systems make nice cold, dehumidified air during the dog days of summer? To understand it, you have to go back to a principle that you may have learned in a high school or college physics class: the rule that any gas cools as it expands. There are many types of air-conditioning systems that can be used in the home, including window units, portable air conditioners, ductless air conditioners, and central air-conditioning systems. Despite their differences, however, the physics of how they work is the same, and they all use the process of direct-expansion refrigeration. In principle, this works very much the same as your home's refrigerator. The refrigerant is the "blood" pumping through cooling tubes in the air conditioner's system. It changes state from gas vapor to liquid as it collects heat from your house and ejects that heat to the outdoors. A refrigerant is a unique substance in that it has a very low boiling point. This means that it changes from a liquid to a vapor at low temperatures. This is key to making an air-conditioning system work safely without generating a dangerous level of heat. Think of the compressor as the "heart" of the system, pumping the refrigerant through all the refrigeration components in a big copper loop. Refrigerant enters the compressor as a low-pressure warm vapor and leaves it as a high-pressure hot vapor. From the compressor, hot refrigerant vapor moves to the condenser. Here, the high-pressure hot refrigerant vapor is cooled as it passes through condensing coils. The coils have thin metal fins (similar to the structure on the front of a car radiator) that conduct heat from the coils. A condenser fan blows air over the fins to speed the cooling of the vapor inside the coils. (Using a fin comb during routine maintenance helps keep these fins in shape.) As the refrigerant cools, it changes state from a hot vapor to a hot liquid at high pressure and moves onto the expansion valve. 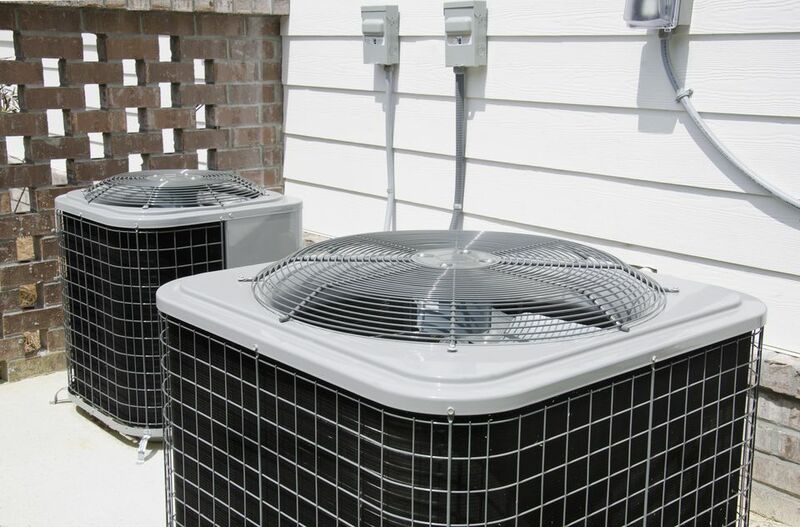 The compressor, condenser coil, and condenser fan are all located that big noisy box in your backyard, which is often called a condensing unit. The expansion valve is what really does the work of cooling. As the hot liquid refrigerant passes through a tiny opening at high pressure in the valve on one side, it emerges as a cool low-pressure mist on the other side. This is the result of a natural property of gases: as a gas expands, it cools. The air conditioner is really nothing more than a device designed to force the refrigerant gas to expand, and that's what creates its ability to cool air. The low-pressure cold liquid that is leaving the expansion valve runs through the evaporator coil located in the plenum of your furnace. (The plenum is the big metal box between the furnace and the ductwork.) Here, the hot air of your home blows across the evaporator coil and heats it up, while at the same time the coil carrying cold, expanded refrigerant gas cools off the air blowing across the evaporator, and the cooled air is circulated through the ductwork. As the refrigerant heats up, it begins to boil and changes from a cold liquid to a warm vapor (a process of evaporation). The refrigerant vapor then travels back to the compressor and outdoor condensing unit, and the cooling cycles continues.